There is no hideaway from the surges generated by this trio. Recorded in 2012 — immediately following their very first meeting at The Stone during a two-week Intakt festival — Crossing The Waters offers exactly what one demands and not a milligram more, an uncommon case of positive foregone conclusion. 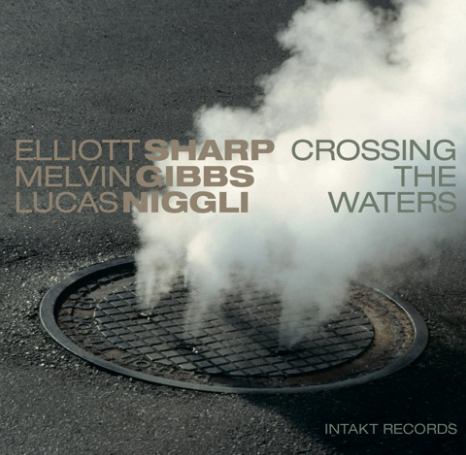 The music’s supercharged matter produced the meltdown of Melvin Gibbs’ amplifier after a few minutes of the concert; in this studio set, the smoke can still be inhaled. I might be afflicted by the just-received dreadful news about Ronald Shannon Jackson’s passing, but in several occasions the semiliterate mind of this observer (and erstwhile drumming wannabe) was inclined to match Lucas Niggli’s percussive projections with the late master’s radical burnouts in the Last Exit heyday. Those big-boned figurations on the tom-toms’ skins and that snapping snare are indeed among the most exalting properties of this stout congregation, oftentimes propelling the transonic mechanism towards the higher levels of lucid hostility. Amidst the thick roar-and-rumble of Gibbs’ fibrous bass and the minatory missives forwarded by Elliott Sharp’s nihilist fingerings (his harmonized and pitch-shifted axe occasionally impersonating a deranged mellotron), components directly linkable with galvanic varieties of punk-jazz and ultramodern blues do appear, typically masked as “intelligently convulsive” brandless clusters. Not that we are complaining. These gentlemen are unquestionably willing to gamble with acerbic clangor but the fundaments of their skill are solidified as enormous rock formations, with nary a moment of unkemptness. The timbral fullness of the whole is something to rely upon for extended stretches of mental body-building. A record driven by intellectual vigor that nonetheless sounds like a group of angered prisoners uttering obscenities from the insides of a tiny cellar. We could mention favored tracks such as “Kayak”, whose grade of threat is almost unendurable. Even so, the point I’m ultimately making is as unglamorous as any simpleton’s assumption: volume way up, if you enjoy being punched in the breadbasket.